Simplicity – We try not to let the means and methods overshadow the meaning and the message (1 Corinthians 14:15-17). The scriptures teach us that our services are an opportunity to encounter God and build each other up. In our judgement elaborate productions can distract us from these vital connections. We also strive to strike a mood of reverent joy. Reverence because we have come before the Lord of heaven and earth. Joy because of the great things He has done for us. Singing – We sing psalms, hymns and spiritual songs (Ephesians 5:19, Colossians 3:16). These will be sung a cappella (without the accompaniment of musical instruments) We sing in this manner because it follows the pattern of the first century church and is the only kind of music authorised in the New Testament for worship. We encourage the entire congregation to join in this time of praise and worship as it gives us the opportunity to express ourselves to God and encourage one another. Preaching – We listen to a message from the Bible. The Bible is the primary means by which God communicates with us and so preaching is an opportunity to hear the word of Christ. Through preaching we learn about the nature and work of God. We receive instruction in how to live our lives as God would have us. And, we are given hope and comfort by hearing the promises that God has made to us (2 Timothy 3:16-17). Prayer – We pray each time we are together (1 Timothy 2:8). Just as preaching from the Bible allows us to hear from God, prayer is our opportunity to talk to God as a family. We bring Him our needs and we ask for His guidance and help. We praise and thank Him for His loving-kindness. Just as communication is vital for the life of a family, so prayer is vital for the maintenance of our relationship with God. Offering – We take up a collection each Sunday (1 Corinthians 16:2). However, we do not ask our visitors to make a contribution but if you choose to contribute, thank you for your generosity. We take up the offering in order to further the work of the kingdom of God in the world. The money is used to support ongoing projects, both locally and around the world. We also use our funds to meet urgent financial needs of our brothers and sisters. Communion – We partake in the Lord’s Supper together each Sunday (Luke 22:15-20). This is a time for us to remember the death, burial and resurrection of Jesus and to celebrate what he has accomplished for us. By breaking the bread together we are drawn into the closest of fellowship with the Lord Jesus, by symbolically sharing in His body and blood. This communion unities together the hearts of those who are partaking as we remember the One who made us a family. By sharing in this sacred meal we are expressing our acceptance of one another as who have received the honour to eat from the table of the King of Kings. Fellowship – At Hyvots Bank, fellowship takes place before and after the worship service (1 Peter 5:14). People simply enter the building and begin talking with each other, shaking hands, exchanging hugs and encouraging one another in the Lord. 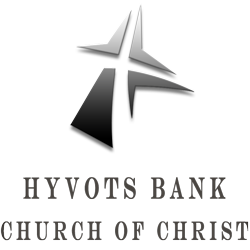 One visit will show that the congregation at Hyvots Bank is a place where real connections are made and where people can find and express their love of Christ.